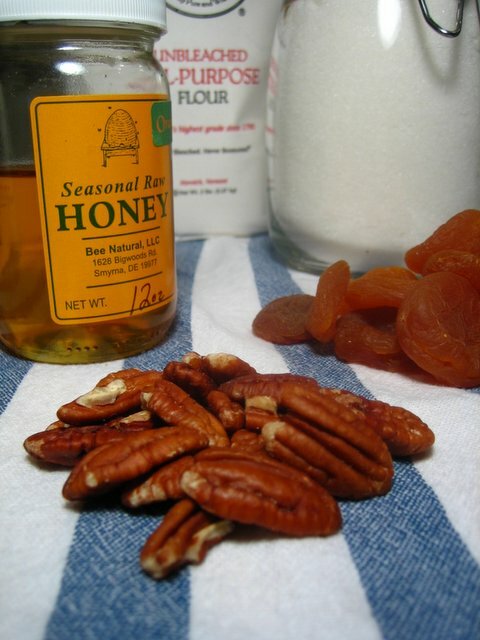 About a year ago, I finally cracked the elusive secret to His Lordship’s favorite cookies, the honey, apricot and pecan ones I blogged about a few years before that. At the time, I was celebrating the fact that I was just this-close to perfection, but frankly, that last little inch of close-but-no-cigar continued to drive me insane for quite some time after. It turns out that I was just one tiny tweak away from the goal, one change so simple it was practically staring me in the face every time I opened the cupboard. The solution was so obvious yet so cunning that I felt both dense and smug when I tried it and it worked. 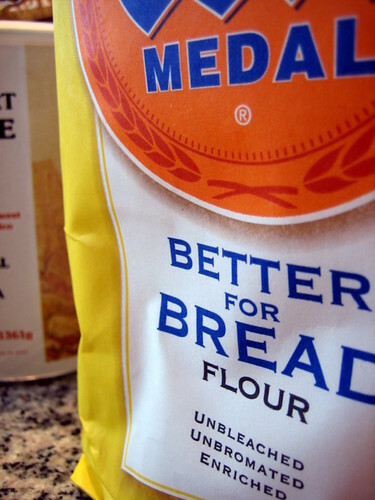 That’s right, bread flour. All the cookies needed were a tiny bit more structure, and using a slightly higher-protein flour was all it took to achieve it. No fiddling with the formula, no experiments with adding more flour in tiny increments, just one simple substitution. With that one change, I stopped the spreading and eliminated the need for all that guesswork about exactly when to take them out of the oven. I got all the puff, body and reliability I’d been after all along, and they received His Lordship’s full, effusive, grinning stamp of approval. To that I say it may be difficult to believe given the absence of chocolate, but more than one person has informed me that these are the best cookies in the world. They’re intensely butterscotchy, sweetly multidimensional thanks to the honey, and simultaneously chewy, crispy, fruity and nutty. It’s all the kinds of decadence you’d expect from a holiday cookie, with the bonus of being low-effort enough to make throughout the whole year to come. You’ll just have to make a batch to see whether you too think these are the best in the world, but even if you ultimately decide another cookie holds first place in your heart, I promise you won’t be sorry to have this one in your repertoire. Melt the butter and place it and the honey in the bowl of a standing mixer fitted with the paddle attachment. Allow the mixture to cool slightly. In the meantime, whisk together the flour, baking soda and salt and set aside. Once the butter is at room temperature, add the granulated sugar, egg, and vanilla, and mix well. Add the dry ingredients and stir on low until barely blended, then mix in the pecans and apricots. Cover the bowl and chill thoroughly, preferably overnight. Preheat the oven to 350 F, and line several baking sheets with parchment paper. Scoop out the dough with a tablespoon-sized scoop and place two inches apart on the sheets. Bake 10-12 minutes, until golden brown in the middle and a bit darker at the edges. Cool the cookies on their sheets until they’ve firmed up, then slide them onto a rack with their parchment to finish cooling. I made twice this amount this time, because I was snowed into the house and had nothing better to do all day, so I’ll be mailing some out as well as taking them into the office. Apart from losing a few bits of pecan and apricot out the top of the nearly-too-full mixing bowl, it worked perfectly, so feel free to scale up. Don’t be tempted to skip the refrigeration step, though. The resting period is important for hydrating the flour and developing the full magnificence of the dough, as I’ve pointed out before. You can also scoop out the dough, pop it into bags, and freeze it to have cookies on demand. The bread flour does an excellent job of firming up the cookie dough, but the dough should still not be allowed to get too warm. It wouldn’t hurt to put the mixing bowl back in the fridge while waiting for a tray to come out of the oven. The now-defunct bakery that inspired this cookie also had a variation with dried cranberries and walnuts instead of apricot and pecan. I imagine you could split the batch in half just after mixing in the dry ingredients, and get twice the festive punch out of one dough. It’s that time of the year again, in more ways than one. Early fall seems to be my usual time for disappearing and/or reappearing here, since it’s my usual time for starting new things, like degree programs, jobs, household projects, not to mention finally making an honest man out of His Lordship. It’s also the time we get a sizable shipment of dried figs from my father-in-law, which I’ve previously documented. This cake, which marks my renewal of the Sunday baking and blogging tradition, is apropos of all of that, since it was inspired by a dinner out last weekend to commemorate our anniversary, the start of my new career, and our return to the East Coast. We resume our narrative at a big-deal local restaurant named after an eating implement, which originally witnessed the very-long-in-coming decision to de-sin our relationship. While the meal was enjoyable and the company was naturally delightful, one of our “small-plate” desserts (a trend about which I have very mixed feelings) was quite the let-down. In principle, it sounded like the perfect not-too-heavy ending: an individual olive oil cake with Marcona almonds, garnished with figs. In practice, the cake was dry, crumbly, and tasted of neither olive oil nor almonds. The only saving grace was that the figs in the accompanying garnish were fresh and very nicely presented. With the first bite, I knew I could do it better, since I already had a great and easy olive oil cake in my repertoire. I had figs that, while not fresh, were so lovingly grown and processed that they were still brightly green and tender, which reminded me of a old-favorite recipe for figs and apricots reconstituted in a honey-lemon syrup. I didn’t have almonds, but since they had added nothing at all, I quickly dropped that element altogether. My path clear, I proceeded to do it better the very next day, on the first try, in about an hour and with minimal kitchen messing-up. Unlike the original, this cake is moist and beautifully springy in crumb, and delicately perfumed in ways that really do hint at sun-dappled groves. 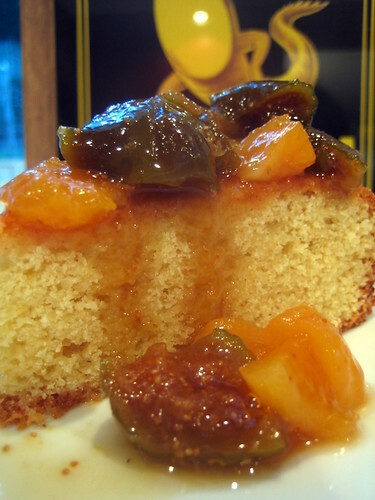 The glistening green-and orange compote instantly clicked with the cake and added even more Mediterranean flair, not to mention perfect fall color. Not a bad way to make a comeback, one-upping an award-winning institution. Sometime soon I’m going to try improving on the rather bland butternut risotto I had as an entree, after a faultless appetizer of wild mushrooms en croute and a Calvados sidecar that made me want to rush across the Ben Franklin to stock up on hassle-free apple brandy for future cocktail applications. Preheat the oven to 350 F. Butter and flour a 9-inch cake pan, lined with parchment paper. In a large bowl, beat the eggs, lemon zest and sugar by hand until frothy and and the sugar is starting to dissolve. Whisk in the flour mixture until mostly incorporated, then stir in the swampy-green yogurt and oil emulsion. Scrape the batter into the cake pan and bake about 45 minutes, until the top springs back when gently pressed, or until a skewer inserted in the center comes out clean. Cool the cake for five minutes in the pan, then invert, peel off the parchment, and cool completely on a rack. While the cake is baking and cooling, mix the honey and water in a medium saucepan. Add the fruit, bring to a boil, and simmer until the fruit is tender and the syrup has reduced and thickened, about 20-25 minutes. Remove from the heat and stir in the lemon juice. Once the cake has cooled, serve generous slices with the compote on the side. While it’s best the day it’s baked, the cake will keep well for several days at room temperature, tightly wrapped in plastic. Any leftover compote can be spooned into a small container and schlepped to work the next day with a single serving of even more yogurt, turning your Monday morning into an entirely different experience. A good, but not great, olive oil is what you’re aiming for here. You want one that is fruity and flavorful, but don’t waste your $40-a-bottle, murky-green unfiltered Tuscan early-harvest on an application that will bake out most of its divinity. Save that one for salads, and grab the $5 a bottle California estate stuff from Trader Joe’s instead. I use the “white” whole wheat flour both to add flavor and to make the cake marginally healthier — although with no butter and all that “good” fat, it’s already about as good-for-you as you can make a cake that’s still absolutely delicious. If you don’t have it on hand, go ahead and use a total of 1 1/2 cups all-purpose flour instead. You can use 1/2 cup of buttermilk instead of the yogurt and milk, although I don’t know about you, but I’m much more likely to have yogurt around during the last-minute, MUST HAVE CAKE NOW occasions when this recipe comes in particularly handy. Likewise, regular plain yogurt is fine instead of the Greek yogurt, but I usually stock the Greek kind, and there’s something particularly appropriate about using it in a cake based on olive oil. Incidentally, the cake is equally wonderful in the summer with fresh berries or nectarines, preferably macerated with a tiny bit of sugar in orange juice or white wine. When we were students, His Lordship and I used to frequent a bakery that specialized in cookies, not high-impact cookies like tuiles or madeleines, but homey, chock-full-of-bits variations on the basic chocolate chip cookie. They were all unassumingly wonderful, but there was one for which His Lordship, who can otherwise take or leave desserts, would take regular detours. It was a honey-apricot-pecan cookie, moist and chewy because of the honey and full of nuts and fruit, and despite the fact that we’d buy a pound of them at a time, they never seemed to last until the next day. We finished school and moved away, and then the bakery closed, depriving His Lordship of the opportunity to buy them ever again. Since he never stopped pining for them, I decided to try reproducing them at home, and began a long and occasionally frustrating quest for the right recipe. 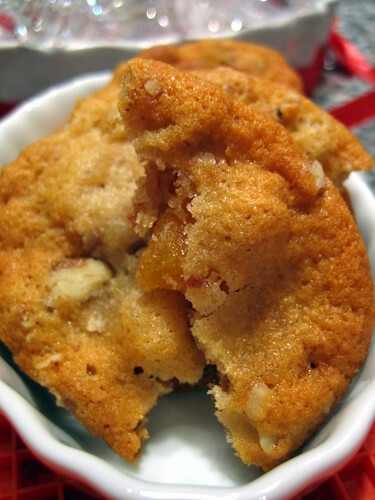 I began by trying to modify a standard chocolate chip cookie with nuts, exchanging some of the sugar for honey and replacing the chocolate with the apricots, assuming that that’s what the bakery had done. The taste was fine, but the texture was wrong. His Lordship wanted it to be chewier, and to have a more pronounced honey flavor. Since nothing I could do to a basic creamed-butter dough would produce the level of chewiness he wanted, I decided to switch the paradigm to a modified ginger cookie instead, which had the double virtue of built-in chewiness and one-for-one substitutability of honey for molasses. Using the same basic recipe underlying the five-spice and bourbon-infused cookies I previously posted, I added a cup each of chopped pecans and dried apricots. His Lordship proclaimed the results closer than any of my previous attempts, and they’ve been a big hit with family, friends and coworkers as well. I appear to be on the right track, but I’m still not perfectly satisfied. Although the combination of flavors and the level of chewiness are right, they still spread quite a lot, producing a much flatter cookie than the one I remember, and, if not watched carefully, they over-brown and become almost praline-like. I’ve tried increasing the proportion of nuts and apricots to add more structure, thoroughly chilling (even pre-freezing) the dough, lowering the baking temperature, and making sure to remove the cookies from the oven while just barely golden. All of this has helped, but not enough. I’m starting to suspect that I may need to play around with adding extra flour for additional support. Next time, I will try increasing it by a quarter of a cup, to see if that makes any difference. In the meantime, it’s still a damn good cookie, even if it can still use a bit more refining, so I’m putting up the in-progress recipe. Keep watching this space for ongoing installments of the Great Cookie Quest. Melt the butter and place in a large mixing bowl, allowing it to cool to room temperature. Once cool, add the granulated sugar, honey, egg, and vanilla, and mix well. 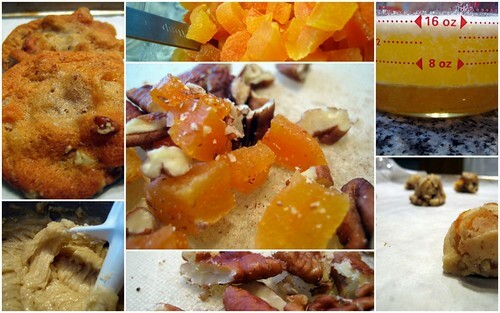 Add the sifted dry ingredients and stir until barely blended, then stir in the pecans and apricots. Cover the bowl and chill thoroughly. Scoop out the cookie with a tablespoon-sized scoop and place two inches apart on the cookie sheets. Bake 9-10 minutes, until just beginning to turn golden. Immediately slide the cookies, parchment and all, onto a cooling rack and leave to cool completely and set up. Notes: Next time, I will try increasing the flour by 1/4 cup to see what that does, and I will probably also increase the amount of nuts and apricots again.